PET/MRI is a relatively new hybrid imaging modality that is mainly used for oncologic imaging. 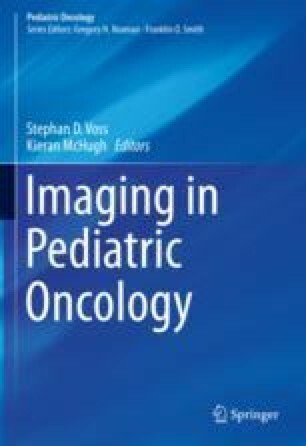 The combination of MRI and PET in a single examination is of high potential value especially in pediatric oncologic imaging due to the combination of precise morphologic and metabolic imaging, relatively low radiation exposure, and the potential avoidance of additional imaging studies. The technical complexity of PET/MRI requires multidisciplinary expertise in preparing and performing the examination as well as in image analysis. PET/MR in children can be performed whenever a PET is indicated, and no contraindications against MRI are present. Thus, PET/MRI can be used for staging, therapy response assessment, and follow-up in children with lymphoma, sarcoma, neuroblastoma, CNS tumors, and cancer predisposition syndromes. In this chapter we will give an overview of technical aspects of PET/MR imaging, review practical aspects related to performing pediatric PET/MR, and present a discussion of potential clinical as well as scientific applications. Dubois SG, et al. MIBG avidity correlates with clinical features, tumor biology, and outcomes in neuroblastoma: a report from the Children’s Oncology Group. Pediatr Blood Cancer. 2017;64(11) https://doi.org/10.1002/pbc.26545. Tsai LL, Drubach L, Fahey F, Irons M, Voss S, Ullrich NJ. [18F]-Fluorodeoxyglucose positron emission tomography in children with neurofibromatosis type 1 and plexiform neurofibromas: correlation with malignant transformation. J Neurooncol. 2012;108(3):469-75. https://doi.org/10.1007/s11060-012-0840-5.